Club member, Rich, opened up his Christmas layout to the club. He’s using Lionel FasTrack (over 210 feet) set-up in his living room. 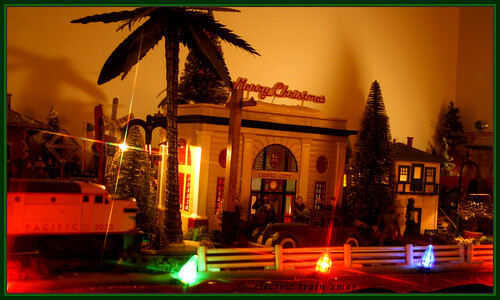 There are 3 villages, 6 trains running, 14 feet of the Santa Fe Super Chief (Golden Gate Cars 22″ Long). Rich also has a modified Polar Express. It has TMCC, back-up light on tender, coal glowing boiler, remote coupler & sounds. There is 1 ZW rigged to 4 separate tracks, and six remote TMCC switches. The layout was designed using RR Track program. Lego City Passenger Train, Lionel Polar Express, and GeoTrax ToyTown sets in action!